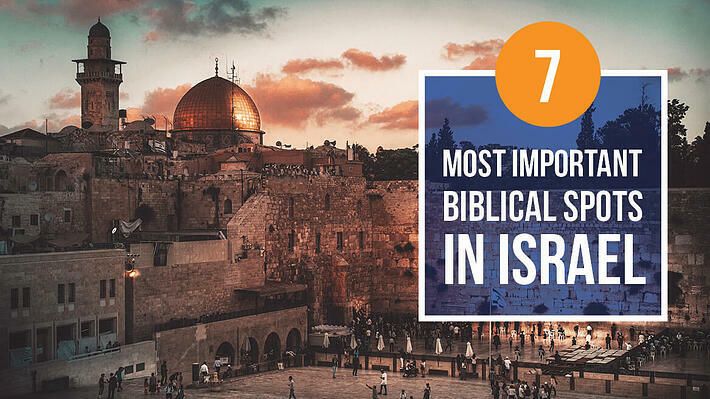 Thousands of pilgrims come to Israel every year to see with their own eyes the places described in the Bible or to gain deeper knowledge of the history behind christianity. To walk in the footsteps of Jesus, Christian tours to israel will take you around Israel for a deeply personal experience where faith and reality meet. The 7 most important biblical spots in Israel are all accessible sites, often full of pilgrims, but keeping always that aura of sacred history! In the heart of the Christian Quarter of Jerusalem, the Church of the Holy Sepulchre stands tall with its round roof visible from afar. This impressive building is made of several chapels and rooms, but the main altar under the round roof is the most humbling of all. All golden, with light streaming down from the round arches lining the walls, this room demands a long pause to fully absorb the atmosphere. 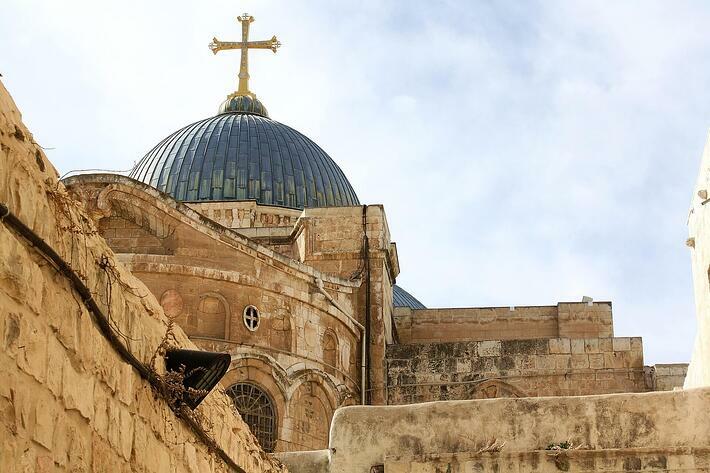 The Church of the Holy Sepulchre is also called the Church of the Resurrection, for this is where Jesus of Nazareth was crucified, but also where he was buried and resurrected. The empty tomb is still there, in the Aedicula, surrounded by an intimate but moving altar. 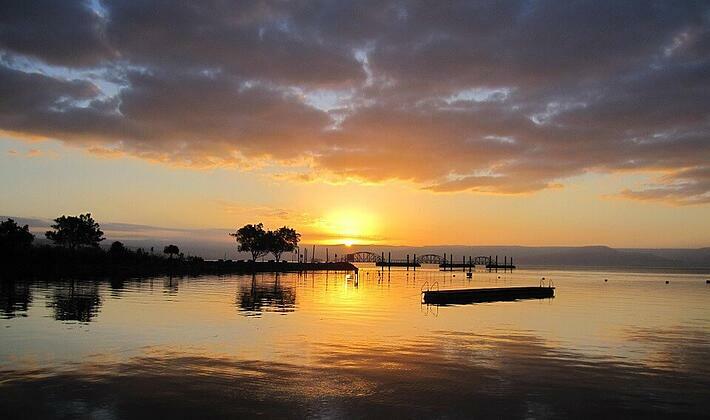 The Sea of Galilee is actually a big lake where Jesus liked to spend time and where several of his most famous miracles happened. To really make the most of your visit, it’s possible to spend several days enjoying the quietness, the nature and the peace of the lake. Many pilgrims choose to take a fishing boat (kept as a replica of the one Jesus would have used) to explore the lake. Capernum, a village located on the shore, keeps alive the many miracles Jesus performed there (healing the Centurion’s servant, the paralytic man, Simon Peter’s mother-in-law, …). The churches in the village and the House of St Peter are well kept and well worth a visit! On the northwestern shore of the Sea of Galilee, very near Capernum, the Mount of Beatitudes is where Jesus delivered the Sermon on the Mount. It’s also a beautifully green place making for a perfect walk through that important chapter of history. The chapel on the Mount of Beatitudes has some beautiful mosaic floors to explore. Last but not least, Yardenit on the south shore is where Jesus was baptized by John the Baptist, where the Jordan River falls into the Sea of Galilee. Today, this site hosts baptisms every day, with pilgrims in white robes coming in flocks to enter the sacred waters. Of course, Nazareth is a stop no one would want to miss on a christian tour of Israel. This typical Israeli town in the north of the country is Jesus’s childhood home. You can even see Mary’s Well and enter the Church of Annunciation, built to remember the visit of the Angel Gabriel to Mary to announce the birth of the son of God. The Mount of Olives, situated just outside Jerusalem, is both a highly significant place and a lovely excursion out of the city. It’s said that Jesus often came to rest and pray there, and it’s not hard to see why. Right next to the bustling city, the Mount of Olives is a green, quiet place with a beautiful view on the landscape around Jerusalem. In the end, this is the site where Jesus ascended to heaven, the Church of the Ascension still marking the exact spot. A walk to the Mount of Olives stays in the mind as both a fresh and deep experience! In the Judean Desert near the Dead Sea, Qumran is where the Dead Sea scrolls where found not so long ago. Excavations keep happening today but you’ll still be able to visit this incredible site. In shades of yellow and orange, the whole landscape seems unrealistic, lost in the desert but still so close to the sea! In the Old City of Jerusalem, Mount Zion offers a great view on the whole city. Aside from the panorama, Mount Zion hosts the tomb of King David and the room of the last supper. Known as the Upper Room, this last point of interest is particularly stunning. Although it has been left empty, with no attempt to recreate the famous last supper, it’s not hard to imagine the scene and to feel the humbling presence of the apostles. The Via Dolorosa is the path taken by Jesus from his trial to his crucifixion. In the Old City of Jerusalem, this road is today marked by nine Stations of the Cross, leading all the way to the Church of the Holy Sepulchre where the empty tomb of Jesus lies. Also called Way of Sorrow or Way of Grief, the Via Dolorosa is often full of pilgrims walking up to the Church, making the way a very moving experience. Christian tours are crisscrossing Israel all year, bringing meaningful experiences to thousands of pilgrims. If the Holy Land calls for you, make sure to hit all those deeply moving sites and come home with a whole new view on the places described in the Bible!